Read here about a polyhedron that is significant to tensegrity geometry. The cuboctahedron is one of the Archimedean polyhedra. It can be conceived as formed of truncating a cube or octahedron. Motro described a tensegrity structure where the continuum of cables is exactly mapped to the edges of a Cuboctahedron. He wrote, “There are four triangular compressed components. Each of them constitutes a circuit of struts (a circuit is a particular case of chain). These triangles are intertwined and their equilibrium is ensured simultaneously by a hexagon of cables and the effect of the three other triangles for three of the apices of each hexagon. Cuboctahedron tensegrity structure, from Structural Morphology Of Tensegrity Systems by Motro. Gómez Jáuregui classes the cuboctahedron-like tensegrity structure as a “circuit” configuration structure. He wrote, “the compressed components are conformed by circuits of struts, closing the rhombus generated by the struts and cables of the diamond pattern tensegrities. Several regular and semiregular polyhedra can be built related to this class, e.g. cuboctahedron, icosidodecahedron, snub cube, snub icosahedron, etc.” In his illustration below, the cuboctahedron is composed of 4 circuits of 3 struts (every circuit interweaving with each other) and the cables defining the edges of the polyhedron. Cuboctahedron From Tensegrity Structures by Jáuregui. Pugh proposed a tensegrity structure consisting of 4 compressed triangles held within a 24 member tensile network. 4 triangles nucleated in a 24 tensile vector network, from Structural Morphology Of Tensegrity Systems by Motro, based on a model by Pugh. 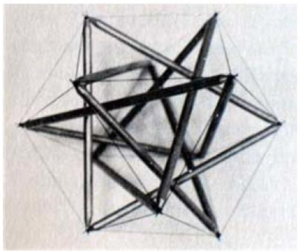 Moelman described a tensegrity structure that outlined a cuboctahedron with 6 struts and 24 tensile vectors. In close packing of spheres, imagine a vertex at each sphere's nucleus. Imagine these vertices connected by struts. 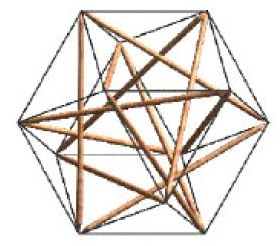 The form described by these vertices and struts is a cuboctahedron. When the Jitterbug is allowed to expand to its maximum volume, it describes a cuboctahedron. As the jitterbug collapses, the square faces of the cuboctahedron become rhombic and then close completely. The IVM is formed by filling allspace with cuboctahedra. This page was last edited on 21 November 2018, at 06:27.